Phabulous is a server written in Go capable of receiving event notifications from Phabricator, a suite of developer tools and forward them to a Slack community, while also providing additional functionality through a bot interface. The project started while I was working at Seller Labs and Phabricator was their repository hosting tool. We mainly wanted to have better integration with Slack, just like GitHub and Bitbucket had. Over time, Seller Labs migrated to GitHub and other tools, so development on Phabulous slowed down a bit since I wasn’t using it on a daily basis any more. However, this does not mean the project is dead, I’ve quietly been finding some spare time to work on improving Phabulous, and it has received a few contributions through pull requests. I recently landed a large refactor of the project which should make future contribution and extensions easier. I’ve reorganized how the code is structured to make better use of Go interfaces. In a perfect world, I would have enough time to write an extensive test suite for the project, but given my limited time, I’ve only been able to cover certain simple part of the project. The transition to interfaces has allowed me to improve the coverage of the project since dependencies can now be easily mocked. Another side effect that came naturally from this transition was the increased modularity of the code. Want to implement a connector for a different chat protocol? Or do you want to add a new command? Just implement the interfaces. Experimental support for IRC: The bot is now able to connect and work over IRC networks. Functionality is almost on-par with what is available on Slack. Modules: Commands and functionality are now split into modules. You can enable/disable them in the configuration file, as well as implementing your own modules when forking the project. 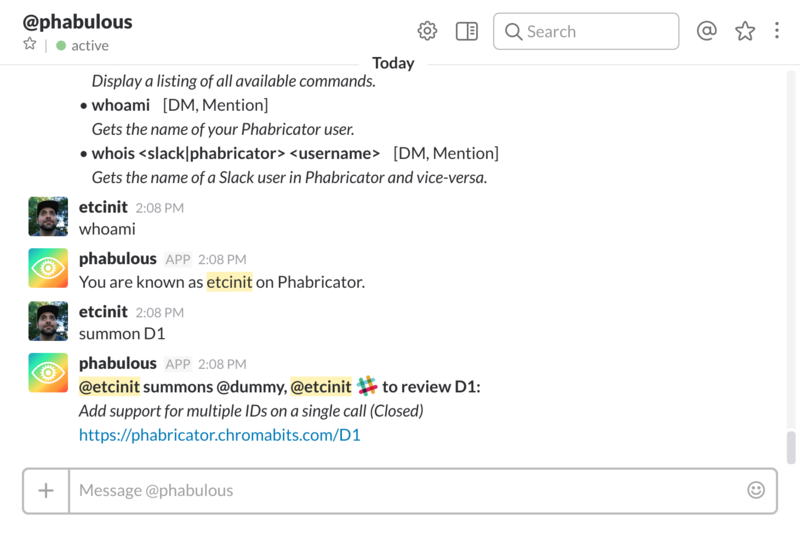 Improved integration between Slack and Phabricator: Phabricator added a new authentication provider that allows you to sign in with your Slack account. Phabulous makes use of this new integration with a new extension. This extension allows the bot to lookup Slack account IDs over the Conduit API, which means the bot can properly mention users on the chat by using their Slack username rather than their Phabricator username. Summon improvements: The summon command can now expand project members if a project is assigned as a reviewer of a revision. Additionally, the lookup algorithm has been optimized to perform less requests on the Conduit API. Many other small fixes and improvements. You can get the latest version of the bot by using Docker or by downloading the latest release on GitHub. Except where otherwise noted, content on this site is licensed under a Attribution-NonCommercial-ShareAlike 4.0 International (CC BY-NC-SA 4.0) license.